Built 1843-1844 as the entertainment venue "Krollscher Wintergarten" (also known as "Etablissment Kroll") by Ludwig Persius and Carl Ferdinand Langhans for the restaurant owner Joseph Kroll, on a site donated by king Friedrich Wilhelm IV. Opened 15 Feb 1844. The complex included three large halls ("Königsaal" a.o. ), a large veranda, a basement hall, and 14 function rooms. Total capacity: 5000 guests. Used as a restaurant, for balls, and for concerts by a resident orchestra. 1850 addition of a garden theatre by Eduard Titz. 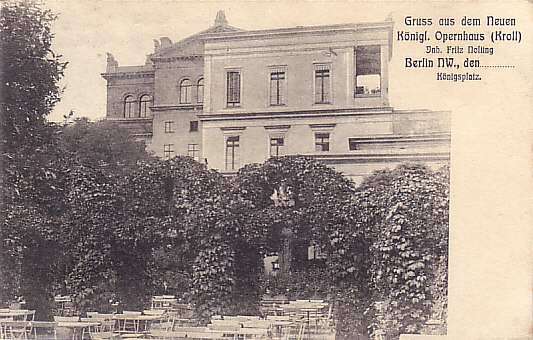 Opened 27 June 1850 as "Sommertheater in Kroll's Garten". Garden theatre demolished in 1856. Since September 1850, the Königsaal was also used as a theatre for opera and drama performances. Main building destroyed by a fire on 1 Feb 1851. Subsequently rebuilt by Eduard Titz, to the original exterior plans and altered interior plans. Re-opened 24 Feb 1852. 1855 renovations and extensions by several greenhouses. During the 19th century, the complex was used by various owners and directors for opera, operetta, drama, and variety performances as well as for concerts. 1600 seats. 1895 extensions by Felix Genzmer and Gustav Hochgürtel. 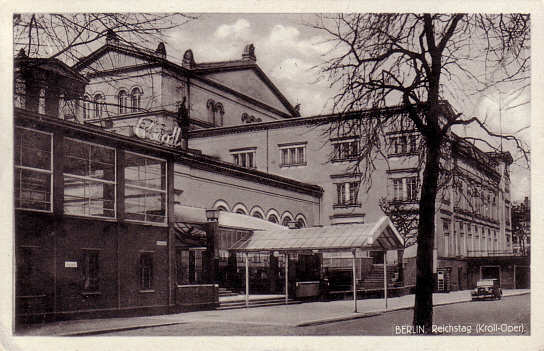 1895 re-opened as "Neues Königliches Operntheater", operated by the Prussian state opera and drama companies. Used as a warehouse in World War I. 1922-1923 major interior rebuilding by Oskar Kaufmann. 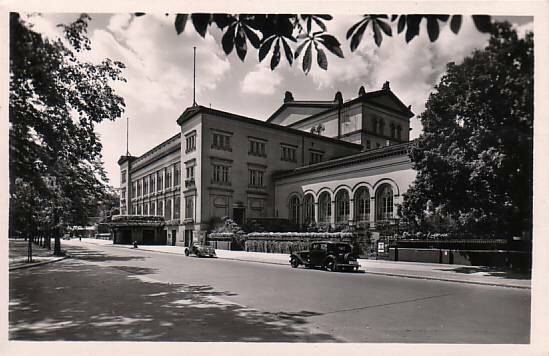 Re-opened 1 Jan 1924 as "Staatsoper am Platz der Republik" (also known as "Kroll-Oper") by the Volksbühne society, used exlusively for performances of the Staatsoper company. 2100 seats. Since 1927, used by a resident opera ensemble under the direction of Otto Klemperer. 1927 extensions. Re-opened 19 Nov 1927 with Beethoven's "Fidelio". 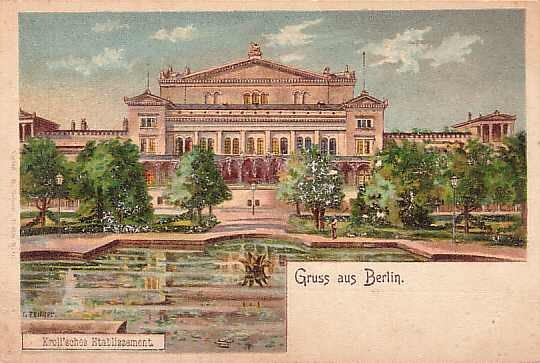 Under Klemperer's direction, the theatre became famous for an avantgarde approach to opera direction, stage sets by modern painters, and the staging of many avantgarde operas by contemporary composers. Closed 1931 (last performance: Mozart's "Le nozze di Figaro" on 3 July 1931). After the Reichstag fire in 1933, the Kroll-Oper became the seat of the German parliament. On 23 March 1933, site of the infamous Ermächtigungsgesetz decision of the Reichstag that ceded nearly all legal power to Adolf Hitler. Subsequently used for staged sittings of the Reichstag (after 1938: Großdeutscher Reichstag), a parliament without any real political power. Site of Hitler's speech announcing the beginning of World War II on 1 Sep 1939. Destroyed by bombs on 22 Nov 1943. Remains demolished on 27 Mar 1951. 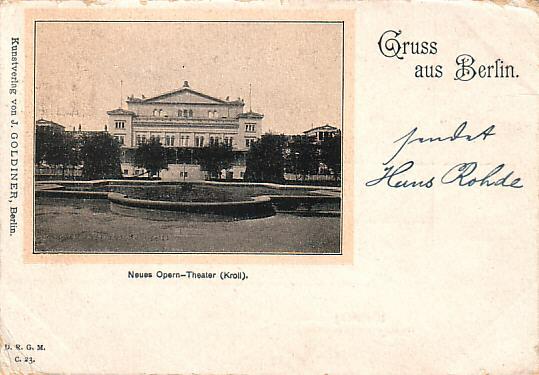 Front Text: "Gruss aus Berlin, Neues Opern-Theater (Kroll)"
Front Text: "Gruss aus dem Neuen Königl. Opernhaus (Kroll) - Inh. 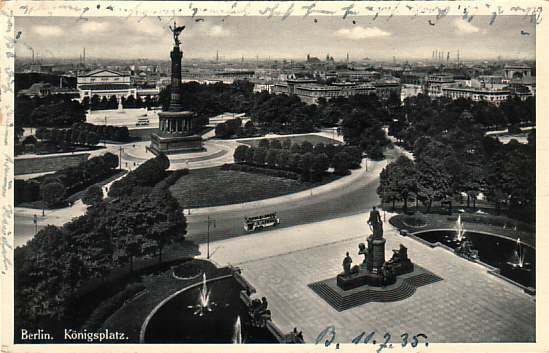 Fritz Nolting - Berlin NW., den... - Königsplatz"
Front Text: "Berlin, Reichstag (Kroll-Oper)", sign on left building: "Kroll"